Healthy oral habits must be encouraged before your child has a single tooth in their mouth. Your child should get an early start with your help at home and timely checkups by pediatric dentists before their first tooth. Dental care is of paramount importance to keep your child’s smile healthy, strong and bright. Our team of pediatric dentists in Ottawa offers services for the youngest patients. At our dental clinic, we strive to emphasize and convey the importance of good dental hygiene in the early years. Leading your children by example and helping them form good oral hygiene habits today will ensure a lifetime of sound dental health. Like most dentists, our dental care team in Ottawa also agrees that toddlers must make a habit of brushing their teeth regularly. By regularly, we mean at least twice a day, because it will be harder for you to teach them when they get older. There will be a host of other issues to deal with as they grow, so dental hygiene must be nurtured right from the start. It is important to discourage negative actions like thumb-sucking before they turn into stubborn habits. You must pay attention to encouraging positive actions, such as swirling water in the mouth after eating, brushing the right way and avoiding too many sugary treats. Baby teeth are not free from risk. They can decay too, and this is not good, because these teeth hold the place for adult teeth, so it is crucial that they stay healthy. By visiting our dental clinic, you can make sure your child’s teeth are developing well, obtain preventative treatments to make their teeth stronger, weed out poor oral habits early and schedule checkups and cleaning at regular intervals. Why Do Toddlers Resist Brushing Teeth? Ask Your Family Dentist in Ottawa! Any dental health professional will tell you that your child is not the only one who does not like brushing; in fact, most children are not naturally inclined to brush their teeth. This is because it seems boring and monotonous or maybe they just don’t know how to do it the right way. As parents, we need to show them how to brush and make it a fun routine to brush together every morning and night. How Can Parents Make Teeth Brushing More Fun for their Little Ones? At our dental care practice in Ottawa, we can give you some useful tips on how to make teeth brushing more exciting for your little one. Buy them a toothbrush especially made for little children. These are colorful, can make funny sounds, may light up, and even have a timer. Make sure it is safe and manufactured by a trusted company. Brush your teeth with them and laugh about it. Buy tasty toothpaste for children! You will find many different flavours on the market. Make it a daily exercise to keep a chart of their brushing routine. Add a “star” or “wow” or “good job” sticker each time they complete an agreed milestone of brushing 10 or 20 or 30 times. Each time they skip a session, you can alert them with a red dot or similar sticker. It is best if your child sees one of our pediatric dentists before they turn one, or within a few months of growing their first tooth. We offer cleanings and examinations to prevent early decay. Our team can warn you early if your child is prone to dental problems. How? We can tell if your child has an irregular jaw or a poor bite, check for uneven gaps, check for gum disease and identify cavities. This way you can remedy the problem early as opposed to waiting because it only gets more challenging and expensive with time. Finally, we can help you care for your little one’s teeth better by choosing the right diet and toothpaste. Contact your pediatric dentists in Ottawa to learn more about healthy oral habits in children. 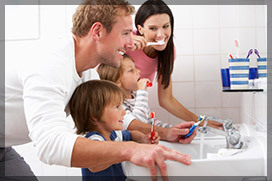 Book your appointment with Family Dental Care today by calling 613-736-5000.